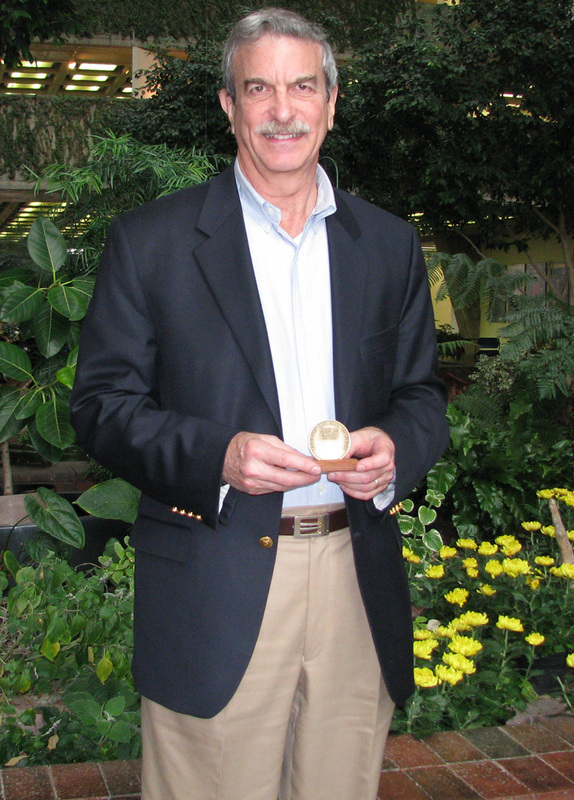 Jeff Appel, Fermilab's assistant director for Program Planning, poses with the DPyC Medal, an award given to him by the Division of Particles and Fields of the Mexican Physical Society last month. 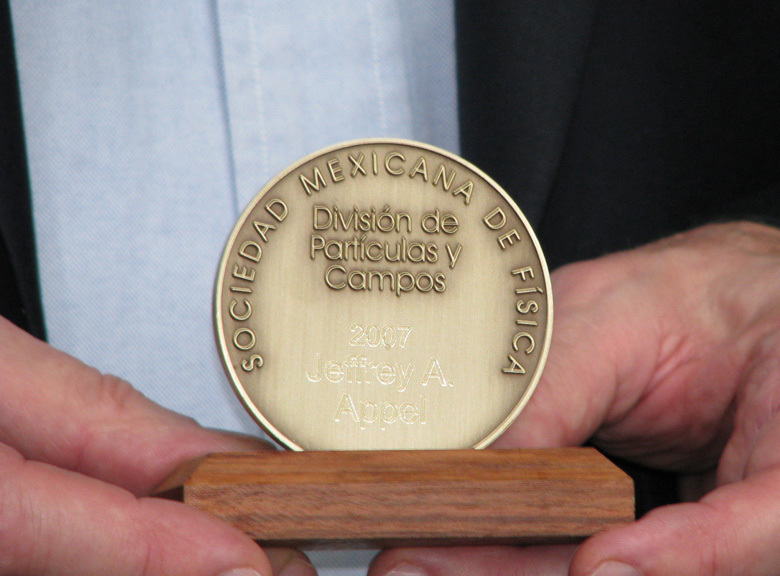 Jeff Appel accepts the Division of Particles and Fields of the Mexican Physical Society DPyC Medal. 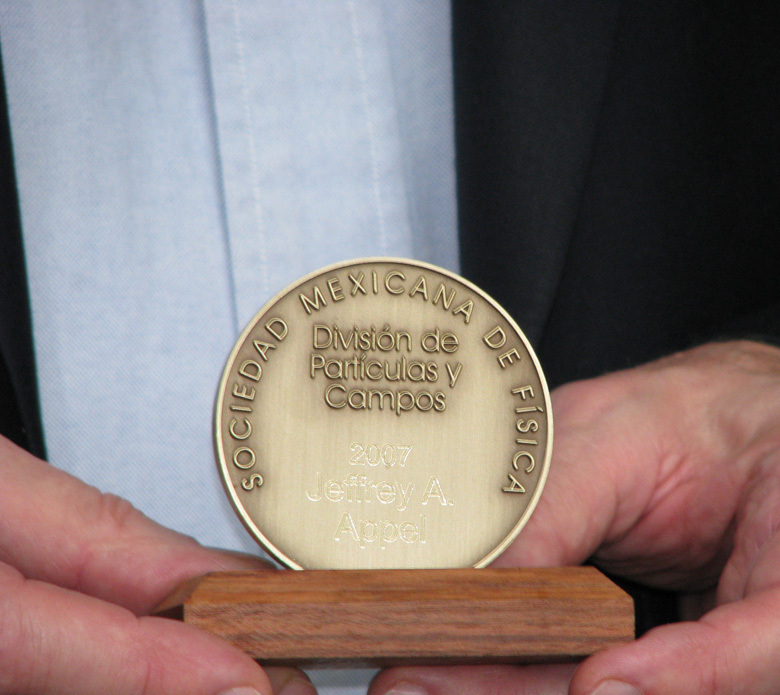 Fermilab's Assistant Director for Program Planning Jeff Appel received the Division of Particles and Fields of the Mexican Physical Society DPyC Medal. Research in particle physics is a global quest, pulling scientists and resources from nearly every continent. Before the 1990s, Fermilab's southern neighbors played a role in high-energy particle physics theory, but participation in large experiments was limited. Embracing the philosophy of the more minds the better, Fermilab's then-Director, Leon Lederman and a handful of staff, including Jeff Appel, reached out to Mexico and other Latin American countries. One result has been a boom in Mexican experimental research and researchers. Now, Mexico is Fermilab's ninth most prolific partnering country in terms of collaboration results. As a thank you, the Division of Particles and Fields of the Mexican Physical Society awarded the DPyC Medal last month to Appel, currently Fermilab's assistant director for Program Planning. The award recognizes a dedication to outreach with Mexico. Appel, as co-spokesman of Experiment 791 in 1991, approached Gerardo Herrera-Corral, of CINVESTAV, a research institute in Mexico City, and Arturo Fernandez, of Puebla University, about becoming collaborators in the fixed-target experiment. "This stage of development of high energy physics in Mexico was very important. It gave Mexico a chance to learn how to create collaborations of people around a specific experiment," Herrera-Corral said. The experiment finished taking data in 1992 and resulted in 35 peer-reviewed papers. Through his job as then head of the Physics Department (and later the Experimental Physics Projects Department), Appel continued to help forge Mexico-Fermilab collaborations, including those with DZero and fixed-target experiments. He helped coordinate summer internships at Fermilab for Mexican university students, and lectured for the Mexican Association of Physics Teachers. Several Mexican students received their master's degrees and PhD's while working with Fermilab. One of the first International Fellows at Fermilab is from Mexico. Appel also was instrumental in getting Mexican electronic engineers on the BTeV experiment preparation team. That experience helped the researchers to train other engineers in their home country. "This was very important to the development of a strong group that now is designing and building detectors for ALICE at the LHC," Herrera-Corral said. 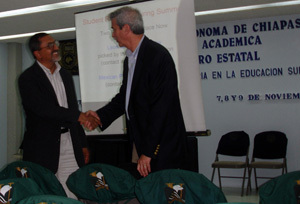 Appel traveled to Tuxtla Gutierrez in the state of Chiapas, Mexico, to receive the award from DZero collaborator Heriberto Castilla-Valdez, of CINVESTAV and currently President of the DPyC. Past recipients of the award include Fermilab's Leon Lederman, current CDF spokesperson Jacobo Konigsberg, the University of Chicago's James Cronin, and the University of Wisconsin's Marleigh Sheaff, all of whom have strong Fermilab program connections. "It's quite an honor," Appel said. "I believe the award was a recognition of the success of the collaboration with Fermilab in developing experimental high energy physics in Mexico. 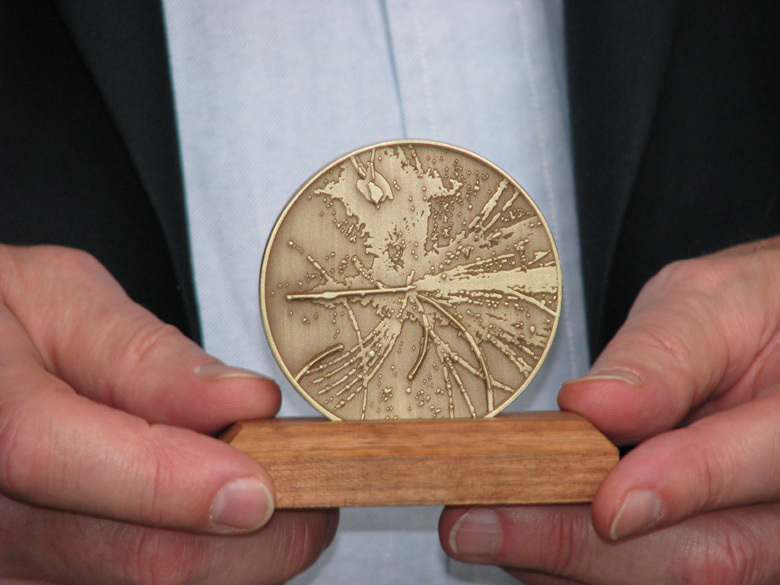 I take the medal as more a recognition of the larger laboratory effort than of me."